Maze Presbyterian Church, opened in July 1859. In 2004, major renovations took place linking the new hall and enlarging the seating capacity of the church. In the early days Presbyterian families living in the Maze area worshipped at Anahilt. This continued until 1833 when the Church at Hillsborough had its first minister ordained. To it Maze families resorted until about two decades later the Rev. Edward Stevenson rallied round him a little band of worshippers on the Cockhill Road. The story of the beginning of Maze Church is largely the story of Mr. Edward Stevenson, a licentiate of the Dromore Presbytery (1842). Dromore Presbytery opposed the new movement at Maze and refused to recognise it. Mr. Stevenson applied to the Belfast Presbytery and helped by Drs. Cooke and Houston got the projected congregation brought under its care, and it remained under this Presbytery until 1877. Mr. Stevenson accepted a call to the new congregation on 4th December 1854 and was ordained by Belfast Presbytery on 20th June 1855. The foundation stone for the Church was laid on the 24th March 1857, and the building was opened for public worship on 1st July 1859. Mr. Stevenson died on 12th December 1890. The next minister was Mr. Hugh Alexander MacKenzie (lic. Route) who was ordained on 15th November 1889. His stay at Maze was brief, for he accepted a call to Balteagh on 24th March 1891 and was succeeded by Mr. Robert Whan (lic. Dungannon) who was ordained by the Presbytery of Dromore on 16th September 1891. His ministry was cut short by his death on 14th November 1899. On 2nd May 1900 Mr. Thomas Dunn (lic. Glendermott) was ordained and remained here for forty years. He retired on 7th May 1940 and died on 6th March 1951. He was succeeded by Mr. Thomas Alexander Noble Parker (lic. Derry), who was ordained on 11th September 1940. For 6 years he was Chaplain to the RAF at Long Kesh, 27 years as organiser of Religious Education in day Schools and Chaplain to H.M. Prison, Maze for 12 years. He retired in October 1981 and on 16th January 2006 celebrated his 90th birthday. He is now Minister Emeritus at Maze. The Rev. James Hughes was installed on 5th January 1983 and died in November 1989. He was succeeded by the Rev. Robert S. McMullan who was installed on 24th September 1990. During his ministry a new church hall was opened in February 1995. Mr. McMullan resigned in May 1996 to take up an appointment as General Director of Scripture Union in the Republic of Ireland. The present minister, the Rev. William Henry who was previously Assistant Minister at Whiteabbey Presbyterian Church, was installed here on 24th January 1997. In addition to his ministerial duties at Maze, Mr. Henry has been Stated Supply minister at Ballinderry since June 2001. During Mr. Henry’s ministry, new stained glass windows depicting the ‘Means of Grace in the Christian Life’ were dedicated in 2000 by the Very Rev. Dr. Andrew Rodgers. 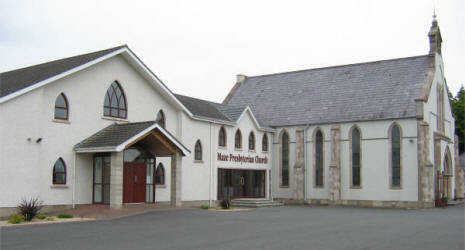 Major renovations took place in 2004 linking the new hall and enlarging the seating capacity of the church. A full history of the church by the Rev. Thomas Dunn (Published 1949) is shown on this web site, click on: History of Maze Presbyterian Church. In about 1853 the Rev Edward Stevenson rallied round him a little band of worshippers on the Cockhill Road. 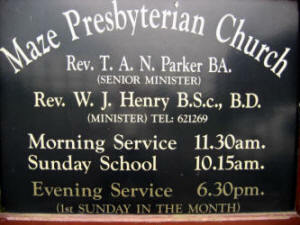 Dromore Presbytery opposed the new movement at Maze so Mr Stevenson applied to the Belfast Presbytery and got the congregation brought under its care, where it remained until 1877. Mr Stevenson was ordained in June 1855 and the church was opened for public worship in July 1859. Over the next fifteen years a manse and schoolhouse were erected nearby and a new church hall was opened in February 1995. The Rev Alec Parker (now Minister Emeritus) was ordained in September 1940. For six years he was chaplain to the RAF at Long Kesh, twenty-seven years as organiser of religious education in day schools and chaplain to HM Prison, Maze for twelve years. He retired in October 1981 and on 16th January 2009 celebrated his ninety-third birthday. The present minister, the Rev William Henry, was installed here on 24th January 1997. In addition to his ministerial duties at Maze, Mr Henry has been Stated Supply minister at Ballinderry since June 2001. During Mr Henry’s ministry, new stained glass windows were installed in 2000 and major renovations took place in 2004 linking the new hall and enlarging the seating capacity of the church.